Mouse models for Alström Syndrome exhibit most of the characteristics seen in human patients with Alström Syndrome, including vision and hearing impairment and obesity. Marshall JD, Maffei P, Collin GB, Naggert JK (2011). Current Genomics 12 (3): 225-235. Larter CZ, Yeh MM, Haigh WG, Van Rooyen DM, Brooling J, Heydet D, Nolan CJ, Teoh NC, Farrell GC.Dietary modification dampens liver inflammation and fibrosis in obesity-related fatty liver disease. Obesity (Silver Spring). 2013 Jun;21(6):1189-99. doi: 10.1002/oby.20123. Epub 2013 May 10. Larter CZ, Yeh MM, Van Rooyen DM, Brooling J, Ghatora K, Farrell GC. Peroxisome proliferator-activated receptor-α agonist, Wy 14,643, improves metabolic indices, steatosis and ballooning in diabetic mice with non-alcoholic steatohepatitis. J Gastroenterol Hepatol. 2012 Feb;27(2):341-50. doi: 10.1111/j.1440-1746.2011.06939.x. Collin GB, Cyr E, Bronson R, Marshall JD, Gifford EJ, Hicks W, Murray SA, Zheng QY, Smith RS, Nishina PM, Naggert JK. 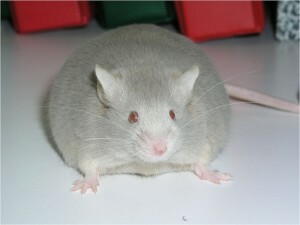 (2005):Alms1-disrupted mice recapitulate human Alström syndrome. Hum Mol Genet.14(16):2323-33. Arsov T, Silva DG, O’Bryan MK, Sainsbury A, Lee NJ, Kennedy C, Manji SS, Nelms K, Liu C, Vinuesa CG, de Kretser DM, Goodnow CC, Petrovsky N (2006): Fat aussie–a new Alström syndrome mouse showing a critical role for ALMS1 in obesity, diabetes, and spermatogenesis. Mol Endocrinol. 20(7):1610-22. Arsov T, Larter CZ, Nolan CJ, Petrovsky N, Goodnow CC, Teoh NC, Yeh MM, Farrell GC. (2006): Adaptive failure to high-fat diet characterizes steatohepatitis in Alms1 mutant mice. Biochem Biophys Res Commun. 342(4):1152-9.